Saw these yesterday. Don't know what they are called locally or where they were purchased but this maybe useful to someone. If only to show a contractor or builder's supply place. Yes that is more of an expanded foam block. There were regular cement blocks as you can see. Or you could just install sheets of insulation between a double wall and would not have any breaks in your insulation. Where did you see em Neal? I regularly scour Builders depots and have never seen that type,maybe new? I chose Supablocks walls as any cavity here could allow pests and have tried to avoid all toxins pesticides due to allergenic reactions. I have no wood in most of the house or organic material other than textiles that may be washed inside and mae Makkan outside. For builders the tropics are different to cooler climes and pest control, screens,positioning of plants to draw them away from inhabited areas can help passive control. Would not an air space between two rows of block to eliminate heat transference work better and be much less expensive? That is exactly what I did while building all my external walls and it seems to work well. Would not an air space to eliminate heat transference work better and much less expensive? That is exactly what I did while building all my external walls and it seems to work well. The house was built it Udon Thani and I do not really know what you mean by "insect free" in Thailand. We have lived in the house for over 2 years and we have fewer insects than my wife's parents house which is a quarter mile down the road. I have three dogs and a small child, so I did not opt for the insect plumbing that uses poison to reduce insects. Any holes were caulked with sealer. I can place my hand on the outside of my house which can be quite warm while the inside wall is much cooler. I also have 2 meter eaves which give plenty of shade for the walls. At the house of a customer which is under construction. He also has an on site "summer house" and they were just sitting on the deck. So I snapped them. If he goes ahead, when the job is finished I can ask him where they are from? Really not sure if they're such a good idea or not, as the whole point of the foam insulation is to reduce conducted heat. Fine, except where the cinder blocks are joined together on all four sides you've got the normal generous wodge of cement conducting any heat straight through. Unless the tolerances are the same as the thermal blocks, with a very thin contact area - which obviously they're not, as they're still cinder blocks - all the gains you make from the insulated block will be lost where they join, as cement is such a poor insulator. The double block would be better, but as has been pointed out either a cavity wall or a double wall with a foam-filled cavity would be considerably better than either due to the hot spot around each block. Singly they may have a good insulation factor, but once you cement them together the cement reduces any gain by a long way. 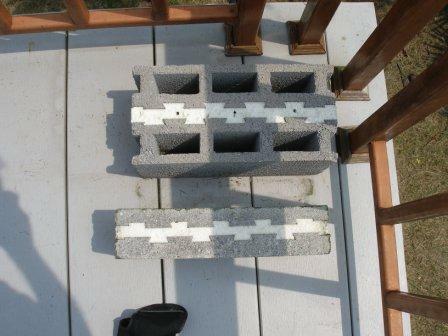 They'd be better than cinder blocks, but I just can't see any advantage over thermal block for a finished wall. I also have 2 meter eaves which give plenty of shade for the walls. This along with plenty of foliage shading the walls is a key factor in keeping the house cool. All sorts of wall materials varying in thermal characteristics but keeping direct sun off the walls and ceiling insulation are more important. It is. When I built not readily available locally so went with the local norm. Red brick. With plenty of wall shade and good roof ceilng/roof insulation, all is cool in the casa. I also had 6 foot eaves on upper deck and a shaded gallery all round. The benefit of Supablock is using 20x20x60 blocks a man can readily handle becise they are ligt yet offer the coolness associated with castle/ temple walls. Ive turned air off until May now and probably use a fan 3-4pm only, the contrast our 2nd unit is the normal block and wife has air on all the time. Couldn't agree more lived in a wooden shack for a while completely shaded by large trees. No air- con, and it wasn't needed. Just a fan. Even in hot season. Now live in a concrete condo, and although it on ly gets sun in the early morning it still gets hot. The whole building seems to soak up the heat. Hi I am trying to find Blown Insulation contractors to install insulation in the rook. Because of the condo design and the C line ceiling I cannot install fibre glass rolls. Does anyone know of any contractors who do blown in insulation in Bangkok? Thanks Neil, a great find and it adds to building options. I can see the use for them in certain applications. 'AAC' block. (Superblock is a brand name). Not too expensive in Thailand, but also take a look at foam panels. I think the white block is good for sound insulation, but both are great heat barriers. In terms of construction, foam filled panels are much easier, and have good load bearing characteristics too. They're also very good for insulation. To save weight on our foundation (5.7 by 3.7 metres with 30 foundation piles 6 metres long...) we'll be using AAC block up to 1.5 metres, then adding SIP panels with windows to give great ventilation. These windows will be brought in 0.5m from the external wall to bring them out if the sun. Using steel, we'll have a 'ceiling' space topped with waterproof/cement platform suitable for use as a second floor balcolny, then a SIP foam filled roof panel to keep the sun/rain off that. Initial build is first floor only, after 2-3 years we simply lift up the roof the the 2nd floor using steel to reveal the new 1st floor garden.